glasseyedave	GalatiansBible, church, doctrine, faith, Galatian, Moses, New Testament, Old Testament, promises, revelation, The gospel according to the gospel, The Gospel the church refuses to believe, Where did Paul get his gospel?, Who taught Paul the gospel? I have come across people who think that Paul had a special revelation from God concerning the gospel we had passed on to us in the letters he wrote to the churches. Does this mean that Paul had Jesus teach him the gospel? I have heard some people talk about how wonderful for Paul to have Jesus come to him in a vision and teach him things never taught before. But is this what Paul is trying to describe in his letter to the Galatian church? Gal 1:11-12 But I certify you, brethren, that the gospel which was preached of me is not after man. For I neither received it of man, neither was I taught it, but by the revelation of Jesus Christ. Does this mean that Jesus came to Paul on several occasions to give him special tutoring, or even to learn things never spoken before to men? We do know that Paul did not go to Jerusalem after he got kicked off his horse and became a believer. His own testimony said he went into Arabia first. Not exactly the kind of place that one would expect someone to travel to in order to find the heart of the message of the early church. You would have thought he would have gone to Jerusalem, not in the opposite direction. Paul didn’t even venture into Jerusalem until three years after he went to Damascus. You know, another one of those centers of the gospel often mentioned in scripture…Not! Gal 1:17-18 Neither went I up to Jerusalem to them which were apostles before me; but I went into Arabia, and returned again unto Damascus. Then after three years I went up to Jerusalem to see Peter, and abode with him fifteen days. When we as unbelievers hear the gospel and respond to it, what we do is get around other believers. We encourage fellowship and good disciples, but never would it cross our minds to encourage a new believer to go to an unbelieving country to get to know God’s word. But this is exactly what Paul did. It would be akin to us telling converts to spend time in India or Indonesia and come back later once they have a good grip on what God has for man in his gospel. This is why some will actually defend the idea that Paul had Jesus come to him in special revelation in Arabia to teach him the gospel message. They even go as far as to claim he had special revelation, something given to him outside of the Law of Moses and the Prophets. But when it comes to visions Paul only kinda brags of one vision. 2Co 12:1-5 It is not expedient for me doubtless to glory. I will come to visions and revelations of the Lord. I knew a man in Christ above fourteen years ago, (whether in the body, I cannot tell; or whether out of the body, I cannot tell: God knoweth;) such an one caught up to the heaven. And I knew such a man, (whether in the body, or out of the body, I cannot tell: God knoweth;) How that he was caught up into paradise, and heard unspeakable words, which it is not lawful for a man to utter. Of such an one will I glory: yet of myself I will not glory, but in mine infirmities. So if Paul is not bragging about a guy who went to Arabia and have Jesus come visit him and teach him the gospel, what happened to Paul in Arabia? We can gain some insight into this by looking at another man of the past that God has used. For scripture does speak of another of whom it said God taught. Since scripture does talk of God teaching this man, should we conjure up pictures in our imaginations of this man taking notes while God is teaching him, like some do concerning Paul? Scripture testifies the LORD appeared again of all things in Shiloh and the LORD Himself revealed Himself to Samuel in Shiloh. Scripture doesn’t give us a clear picture of what happened to Paul in Arabia, but it certainly does of Samuel. And the testimony is true. The LORD appeared and then taught Samuel Himself as He revealed Himself to Samuel. Sooooo… How did the LORD do this? Scripture does not say it was by any other way than by His Word! 1Sa 3:21 And the LORD appeared again in Shiloh: for the LORD revealed himself to Samuel in Shiloh by the word of the LORD. It doesn’t say Samuel had a whole new revelation of God when the LORD taught him. It says he was taught by God’s word. This would be the Law of Moses, the book of Judges and maybe the book of Job. But not much more than that. Applying this to Paul, we can see that he did not have to have a whole new word of the Lord to be revealed to him for it to become his gospel as some think. All that was necessary for Paul to say, “neither was I taught it, but by the revelation of Jesus Christ”, was for him to get the revelation of Jesus through the Word. This would be the Law of Moses and the Prophets. To cinch this up, all we have to do is look at what Paul was preaching in the last half of the last chapter in the book of Acts. Well, well, it says he was preaching of Jesus and His kingdom from the Law of Moses and the Prophets. Most people do not realize this when they read about Paul getting knocked off of his horse on the way to Damascus, but Saul of Tarsus already had all that he need to become Paul the Apostle when it came his gospel. In his letters Paul never quotes anything remotely close to any new revelation that some say he got first had from Jesus in Arabia. Instead his letters are full of quotes from the Old Testament. There is a bunch about Abraham and circumcision. Some about Hagar and the Ishmael. The promises given to the fathers and so on and so on. What happened to Paul in Arabia is what can happen to every new convert that comes to Christ. We can get a revelation of Christ from His Word. Isn’t this supposed to be what happens to us during our devotions and study of His word? While it can be said that Paul had somewhat of the experience you describe, his was unique for more than one reason (also, keep in mind ‘…will show hiim how many things he must suffer…’). My post was not advocating sending new converts out to discover the gospel on their own. I said, “it would never cross our minds” and “be akin to”. I didn’t see any of my comments as a condemnation on the church, but a contrast to what happened to Paul. The points being: 1. Paul had what he needed in the Law of Moses and the prophets before he went to Damascus. 2. Paul did not get an extra biblical revelation “some new revelation” not already found in the word of God as some proclaim to defend what goes against the Law of Moses and the Prophets. 3. It was not necessary for Paul to have Jesus light up the room with His glory in order for Paul to get this revelation as some invision. 4. Just like Paul and Samuel, all we need is found in the word of God. God did not go outside of His already revealed word to reveal Himself to these two great men. 5. Just like those men we too have the same Spirit and word available to us today. I am sorry that you saw it like you did, but that was not the intention I was aiming at. Interesting that all of the references you refer to regarding Paul are all references written by Paul. Let me try it… if anyone eats hot dogs they will burn in the Lake of Fire. As is written, “Anyone who eateth the unholy hotdog will suffer Hells fury”. Blind “Christians”. The believers of Paul have caused the apostasy we are now experiencing in the church. The Calvinistic doctrine that has been cemented by the Catholic church will lead so many to their spiritual death. “St. Paul”, pft, who made him “Saint”? You? The Vatican? Who? Certainly not the Bible or Jesus or the disciples. 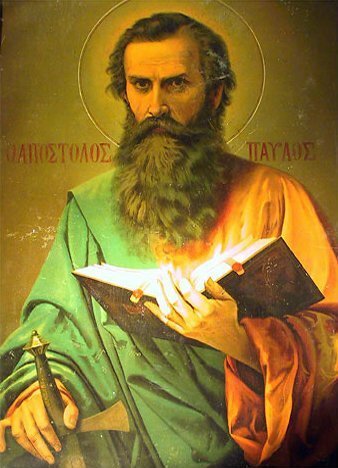 Paul made Paul an “apostle”, how can you still be so misled? Very sad indeed. I do not know if you will see this response or not. But the beef is not with Paul. The beef is with the church who ignore what Paul has written and made their own gospel out of a few phrases of Paul’s. Paul does not teach that we can be carnal and still go to heaven. NONE of the gospel does. It is men that teach this. You are right it is the work of Calvinism. Paul does not teach we no longer do the Law even though we are dead to the Law. Instead Paul teaches that we through the Spirit fulfill the righteousness of the Law. With the Law we are not to commit adultery. In the Spirit, Christ takes lust out of the man. The gospel message is that through the Spirit a man can have a change in him that the Law never can. If you get this note let me know and also let me know what you think about what I said. I am saddened that you are so close to the truth yet so far away. Why would Paul head in the different direction than that of Jesus’ disciples, the very ones blessed by Jesus? Why would Jesus come and teach Paul for three years? It did not happen, that is why. Paul was a destroyer of believers before and after his “Damascus experience” which by his own account is inconsistent (Acts 9:7 & 22:9). When one looks at Jesus’ teachings neither He, His Disciples, or His followers were led to believe that living outside the Law, or Lawless lives was the will of God. Paul is the one who taught all of that. Far too much has been written proving the blasphemous teachings of Paul. How terrible in the time of judgement for those who choose to live by Paul’s Lawless doctrine over that of God and His son. God’s Law stands. Jesus is very clear on that (Matthew 5:17-20). Believers must follow the commandments of God (Rev. 22:14-15). All will be judged on their works (Rev. 20:12), not on their faith (Matthew 7:22-23). Please read the New Testament and exclude Paul and you will find that a far different message was being taught. I pray that you all come to learn the truth, for it truly will set you free. Apparently you have not read my blog. My blog states over and over again that Paul teaches that we will be judged by what we do not what we believe. I know that most of the church thinks just the opposite of this truth in the bible, but it doesn’t make it any less true. Paul says in Gal. 6 and Rom. 2 that we will be judge by what we do. In Rom. he calls it doing wickedness or doing righteousness. In Gal. it is described as living in the Spirit or living in the flesh. In Rom. 8 Paul talks about those who live in the Spirit have no condemnation, those who live in the flesh are an enmity with God. Very key in Rom. 8:13-14 is absolutely the key and the heart of Paul’s gospel. For if ye live after the flesh you shall die, but if ye through the Spirit do mortify the deeds of the body, ye shall live. For as many are led by the Spirit of God, they are the sons of God. This is also repeated in Col:5-6. Should I go on to tell how we are circumcised in Christ by the putting of of the sinful nature. Even Christ say in John 5. that the dead will hear his voice and come out of the graves. Those who have done good unto the resurrection of the life, and those who have done evil unto the resurrection of the damnation. You are right to be upset with a church that teaches a man can live in the flesh and be a born again child of God. But you will not find that teaching here. I do not know you to say where you are coming from, but let us not forget it is through the Spirit that we put to death the deeds of the flesh. just as Paul does teach. Which one of the fruits of the Spirit violates the Law? None! But the Spirit instead of simply keeping in a man out of adultery, the Spirit changes a man and takes the spirit of lust out of the man. Living by the Spirit is far better than living under the Law. Just as Hebrews states, the Law and its ordinances were week and that we are not to live under it anymore. We are to live according to the power of the endless life, which only comes from truly being born again and turning from sin and living in the Spirit. Which is the very same gospel Paul actually preaches. Please read my blog and not attack me on something I have never said nor ever will. Thank you for your words, I agree with you. Paul is a destroyer of the Word, not a prophet or apostle. Anyone who believes that Paul was taught by Jesus is being deceived. It is amazing that Christians would so adamantly defend the very one that Jesus warned us about. Paul is a fraud and will lead countless millions to their death. The Law is NOT dead. In fact Jesus tells us all that very clearly, blind Paulinians! People make the mistake of saying the gospel according to the book of John, or the gospel according to the book of Romans, etc. What it really is, is the book of John according to the gospel, the book of Romans according to the gospel. Remember the gospel we believe was preached at Mt Sinai according the book of Hebrews. Even the Old Testament is our gospel. Paul says in Romans that a righteousness from God in Christ Jesus is revealed in the Law. I believe it had to be something more than learning from what was already written. The Mystery kept hidden from before the foundation, Jew and Gentile together, salvation by grace alone, the Body of Christ, no longer under condemnation of the law….none of this was known until Paul revealed it as revealed to him by Jesus Christ. Who taught Paul during his three years in Arabia? Perhaps these words right out of the mouth of our Lord might give us a hint? I can definitely attest to this role of the Holy Spirit who in the last fifteen years as a Christian of forty four years, has had numerous mind boggling teachings that seamlessly flowed supernaturally into my heart and mind. But for those who believe Paul was a “destroyer of the Word”, well I guess that must be a revelation straight from God. Perhaps we should just tear up the rest of the Bible, also – at your command of course.